Hi Lars. How old are you and what do you do at MailStore? Hi Julia. I’m 30 years old and I work in the MailStore support team. I have been working at MailStore for two years. Before that I worked as a network administrator at various different companies. I process technical requests for MailStore customers and prospective customers. I am also in charge of the MailStore Home community, where I help MailStore Home users with their questions and problems. No, but I am generally in charge of Python Wrapper for the API. Personally, my focus lies in networks and protocols. I also deal with email servers, storage systems, and email clients in the course of my daily work. That means everything that has anything to do with archiving. The challenge lies in the sheer number and uniqueness of the configurations. Each customer has his own infrastructure and his own ideas about what archiving should accomplish. It’s hard to say. There are of course a lot of standard situations that are easily handled. But there have been some cases that took longer to solve. It often had to do with the combination of various systems that didn’t function well together. For example, there was one case in which IMAP archiving malfunctioned in certain folders. Access was denied by the IMAP server. Upon closer inspection it was discovered that the employee had been using a web client and created a folder that contained a ‘/’ symbol. Unfortunately the IMAP server uses the ‘/’ as a folder separator, and the mail server claimed that there was a folder called ‘HR.’ MailStore tried to archive the folder ‘HR,’ but it didn’t exist because it was actually called ‘H/R.’ The folder was renamed in the web client and could then be archived. Yes, of course. It is rare for someone to end up in this line of work without a personal interest in IT. At the moment I am busy setting up multimedia equipment in my bedroom. I like to spend my weekends with family at all different kinds of events. 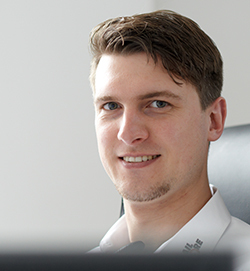 Read further staff interviews from Björn Meyn, Dave Warren, and Daniel Weuthen or return to blog entry “How MailStore Defines Top-Rate Support”.